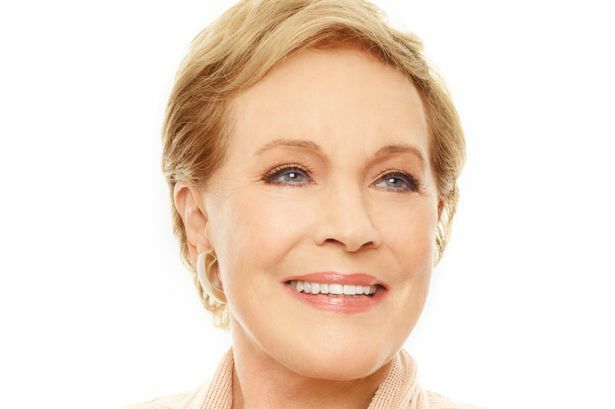 National treasure Dame Julie Andrews gives a rare interview to Roz Laws . She talks of her favourite things, including her bionic ankle. Mary Poppins and Maria Von Trapp would be shocked. Would Julie Andrews really want to appear in an outrageous movie in which she passionately kisses a heartthrob 40 years her junior? Well, yes. Dame Julie tells me that she deeply regrets missing out on the role in the Oscar-nominated film Wolf of Wall Street, which features copious drug-taking, orgies and dwarf-throwing. It went to Joanna Lumley, who has been cheerfully telling everyone how her kiss with Leonardo DiCaprio took 27 takes. Leo plays a corrupt stockbroker in the Martin Scorsese film, while Joanna is Emma, his wife’s aunt. Julie reveals she was forced to turn the film down because she was still recovering from an operation on her ankle. “I’m a proud bionic woman now with a titanium ankle, which is rather rare,” she confides. “The operation saved my life. I’ve had problems for a long time with my ankle, after I twisted it many years ago. “With general wear and tear it got worse, and eventually it just had to be taken care of. “I was finding it very hard to walk, I was hanging on to anything I could find. I didn’t like what I saw for the future. “So I had the operation nearly two years ago. “I’m fully recovered now, but I wasn’t over it when I got the Wolf of Wall Street offer. I would love to have been part of the film but I couldn’t, alas. “It was a really tough choice but I didn’t feel up to it. I was still having a hard time getting about, so very regretfully I had to decline the offer. Dame Julie is speaking to me from her home in Long Island, New York. The rare interview has been granted to publicise her forthcoming UK tour of An Evening With Julie Andrews. She is appearing at Birmingham’s NIA on May 24, one of only four British venues. The iconic star of stage and screen will be joined by presenter Aled Jones, who will introduce Julie as she talks about her life and then put questions to her posed by the audience. “An Evening With came about a while ago,” she remembers. “I’ve done lots of speaking engagements around the US and last year I had a very happy trip around Australia. “Because that was so successful, the English producers thought ‘why would she not come back to England?’. I jumped at the chance. “I think it will be extra special in my home country. I will talk about things that are more relevant to England and share a few extra nuggets they may not have heard before. “My favourite part is the questions from the audience. I don’t know in advance what they will be and sometimes they are quite funny. Dame Julie, 78, was born in Surrey and became a child actress and singer. She appeared in the West End at the age of 13 and made her Broadway debut at 19 in 1954. She won Tony Award nominations for the musicals My Fair Lady and Camelot, but it was her film debut in Mary Poppins in 1964 which really shot her to fame and won her an Oscar for Best Actress. She won her second Oscar nomination for The Sound of Music, a classic ranked as the third highest grossing film of all time. Julie has recently enjoyed a revived film career with the success of The Princess Diaries. She also lent her voice to the Shrek and Despicable Me animated films. Her impressive singing range was damaged during a throat operation to remove nodules from her vocal chords in 1997, but she is still caught up in legal wrangles over it and won’t discuss it. She won’t be breaking into song during her evening in Birmingham. Julie was married to the American film director and producer Blake Edwards, the man behind Breakfast at Tiffany’s and the Pink Panther films, for 41 years until his death in 2010 aged 88. She had four children with him, plus her eldest daughter Emma from her first marriage to set designer Tony Walton. Julie says: “I lived with my husband in Los Angeles, where his work was. “But when he died three years ago I moved here to Long Island. Emma is here with me and I write children’s books with her. “I have nine grandchildren, can you believe it? They keep coming, aged from in their forties to a year old. And I have two tiny great-grandchildren. “They are all delicious. Most of them are in LA though Emma has two beautiful children here who I get to see. I love getting everyone together for a family night. “I find it very hard to believe that I’m 78. I seem to have lost 20 years of my life somewhere! “I’m just very lucky, I have a pretty good constitution and I have worked all my life. I love doing it, if I wasn’t working I would have to find something to do. “Writing books keeps me busy. I never stop that antenna on top of my head from swivelling around and searching for new ideas. “One book is going to be made into a film which I am directing. That’s a thrill, I can tell you. The work ethic has been ingrained in Julie from an early age. She found herself touring the country in vaudeville shows as a young teenager. She remembers: “I played Birmingham a few times but I haven’t been back since I was about 16. “I’m really looking forward to seeing, after all these years, what Birmingham is like today. “You have a new library? How fabulous, I’m all for that. “I seem to remember staying at the Midland Hotel, right by the station. “I was doing the variety circuit, singing my songs with my high soprano. I was considered a child phenomenon with a freaky high voice. The recent release of the film Saving Mr Banks has brought the making of Mary Poppins into the spotlight. It follows the efforts of Walt Disney, played by Tom Hanks, to deal with difficult author PL Travers (Emma Thompson) and turn her book into a film. Julie met Emma on the red carpet at the film’s premiere and the younger actress described the encounter as “the coolest thing ever. She’s such a funny, sassy, witty woman”. Julie is equally gushing about Emma. “She is such a sweet lady, my new best friend. So has Julie been similarly starstruck when meeting her own idols? “Oh yes,” she smiles. “When I got to Broadway I met people like Ingrid Bergman, who came to see My Fair Lady and was so beautiful. Julie’s voice is the one we all remember from the classic films – cut glass English but now with a hint of an American accent, as she’s lived there for so long. But what does she miss most about her home country, and what will she be taking back with her? Julie begins to list what is, I realise, a few of her favourite things. “PG Tips, of course, and digestive biscuits. The things you’d imagine, really, and the goodies I love. Julie sounds thoroughly sincere when she ends our conversation with her thoughts on her night in Birmingham. As if Mary Poppins could deliver anything other than a magical experience.